Elanee's Endeavors ! : Recent Endeavor- Published a Book! So about two years ago, I wrote a poem for a writing contest entitled "What Our Flag Means to Me." 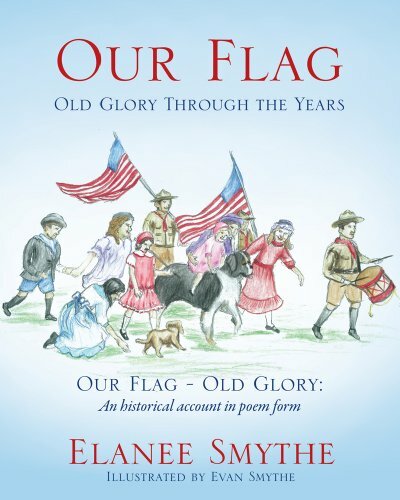 The contest wasn't supposed to be a poem contest, but rather a writing contest to share what you believe about the American Flag. I had been inspired and touched by a short Christmas book in poem form, and so I really wanted to write a poem for the contest. But who writes a 500 word poem? It seemed to be a rather daunting task, and considering that I only had 2 days between when I found out about the contest, and when the entries were due, it was really looking like I wouldn't be able to participate. So, I thought about the contest, and prayed about it, and talked with my parents about it, and came to the conclusion that I should do my best and see what happened. So for about 5 hours the night before the entries were due, I sat down and wrote, and rewrote, and remote, a 500 word poem on the history of the American Flag, and how it affects us today. My sister kindly typed it, (since I didn't do anything computer related at the time:) and we mailed it off the next morning. I actually forgot about not hearing back from the contest since we got busy preparing for our 4th of July party, and so when I received a call saying I won first place. I was overjoyed, and very surprised. Within the week after I won the contest my Dad set it up so I could be interviewed in our local newspaper. This was a new opportunity for me, and it was fun to be able to experience. After that, I received the plaques and prizes in the mail and thought that was the end of the poem. But God had other plans. Over the next few weeks, my Mom showed the poem to some friends, and many people liked what they read. One friend who we didn't even know that well was so moved by the poem, that the next time we saw her, she had printed out a 3 ft copy of the poem, and gave one to us, and had one framed for her house. This was very amazing to me, and I never expected anything to come out of a simple writing contest. After that, my Dad decided it would be neat to put the poem into a book form. Evan began drawing pictures, and after about a year, we had enough pictures to add to the poem and make a completed book. Dad graciously went through the process of selecting and editing the publishing book and we were really excited to have the completed book published in July. It was a blessing and a tremendous example of how our simple actions can be used by God and duplicated in far more ways than we could ever imagine. I thought I was entering a simple contest that I didn't even expect to win, but God took that simple contest, and multiplied it to become a beautiful published children's book. Praise God! He is SO good! And here is the poem in case you're interested in reading it. Seek a land that's home for the brave. Where wrong is prevailed by right. America was young in years. To live and die the same. A symbol was needed, our unity to maintain. America needed one that all people could really understand. Declaring that stars & stripes were the solution. In this land where happiness is pursued always. We must remember the colors mean something too. Who have given their lives and would give them again. But freedom and purity will forever last. To do our best and never retreat quickly. And much change we have known. Have given their all our country to save. From depressions and ruin that have threatened us all. A tribute to unity, our great aspiration. Old Glory has remained and so has our protection. As we've made choices and searched for guidance. During the great "civil" war on our brothers. In France, Asia and Germany. Established cities and flew planes far away. And there it has stayed hoping we'll come back soon. Witnessing history again and again. Our flag is honored, may it never fall. May it fly unendingly, from sea to shining sea. And finally click here for a link to the published book! How wonderful! Congrats Elanee on the very good poem and the book!